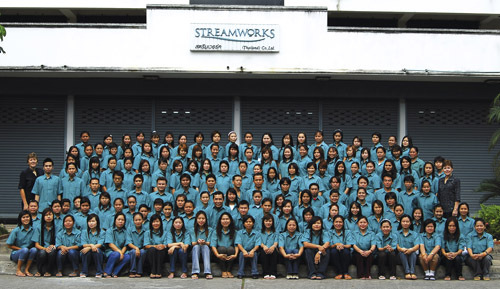 Northern Thailand is the home of Streamworks (Thailand) Co., Ltd. – the exclusive manufacturer of Rainy’s© premium flies and many materials since 1999. Originally owned and operated by McKenzie Fly, the company hired Rainy Riding and Ellen Clark to personally manage their growing fly tying operation. Rainy and Ellen closed their prestigious fly fishing retail shop in Logan, Utah, packed up and moved to Thailand. McKenzie eventually sold to some retirees from Microsoft who changed the name to what is known as Streamworks (Thailand) Co., Ltd. Shortly after, the company was sold to 3M. Rainy and Ellen were retained as company directors. 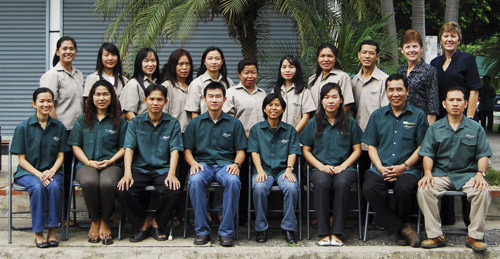 Then in 2002 Rainy and Ellen purchased the company and now own and personally operate it today. When not in the USA enjoying the company of her four children, their spouses and five grandchildren, Rainy is overseeing the day-to-day production of the manufacturing facilities in northern Thailand. Her presence and years of expertise ensure that the integrity of each fly pattern is maintained. She also fishes whenever and wherever she can! Though Ellen grew up a country gal in southern Idaho, she has made Thailand her second home. After receiving her Master Degree she worked for 14+ years as a Marketing/Sales Manager. Rainy was her across-the-street neighbor when they first met. Ellen helped Rainy with her home-grown business for a few years, then an opportunity opened up to allow them to consolidate resources and strengths in order to grow Rainy’s© into what is now globally-known industry icon.